30 mrt Green Campus: what’s in it for students? But Amsterdam Green Campus wasn’t built overnight. What started as Haring’s hobby has grown to include several sustainability initiators, most notably being the the Universities of Applied Sciences of Amsterdam, InHolland and AERES Hogeschool Almere, Amsterdam Economic Board, Greenports Aalsmeer and Noord-Holland Noord, Wellantcollege, Cluisus College and Innovation Exchange Amsterdam. ‘These initiatives are exactly the ones that should be given that push,’ asserts Jaap Bond, delegate from the Province of North-Holland, ‘financially, or otherwise’. It is the hope he puts his money where his mouth is. Bond, and by extension the Province of North-Holland, has agreed to co-finance the project with no less than 10 million euros. That amount of financing is not for nothing. Amsterdam Green Campus has ambitious plans. Haring totes the Amsterdam Metropolitan Area as one of the most innovative and sustainable regions of Europe, especially when it comes to food safety and security. To keep its rank, he stresses Amsterdam must fuse the boundaries separating research, education and entrepreneurship. Avant-garde scientific knowledge must engulf—not trickle—into educational programs and the hands of entrepreneurs. In addition, Bond states that there is a shortage of well-educated people on the technical and green labour market and the Amsterdam Green Campus could play an important role in this. Amsterdam Green Campus, by way of three themes: Green Genetics, Green Chemistry and Green Environment, strives to make that happen. Haring compliments UvA’s Science Park as a booming source of motivated and inspired students but expresses concern about their potential involvement in Amsterdam Green Campus. At the launch event he asks students in the auditorium to raise their hands. With roughly six hands in the air, his doubts are quickly validated. Representatives from prior workshops had suggestions to improve the educational programs to fit within the aims of Amsterdam Green Campus. For example, offering minor programs to improve the stream of MBO level students to HBO level and from HBO to WO. In many cases, existing pre-master preparation programs can be altered to a minor format so students pursue these during, and not after, their bachelor programs. To further improve them, they should be designed together with industry stakeholders so student’s education fits to market demands. Internships at company partners should also be encouraged. This is already underway at the COAST program, under the theme of Green Chemistry. According to Peter Schoenmakers from the Van ‘t Hoff Institute for Molecular Sciences (UvA), it has been a huge success as small companies particularly value knowledge from universities and institutes. Green Chemistry is not alone. Under the Green Genetics wing, Hedwich Teunissen from NAKtuinbouw proposed, ‘the collaboration between companies and universities could be valuable when implementing new technologies for which specific knowledge is required’ Jeroen Aerts (VU) added within Amsterdam Green Campus, students are critical for the work on research projects. For instance, water climate risk management at companies, since it is often difficult to get these kind of companies to start with large sustainability projects. But what’s in it for students? 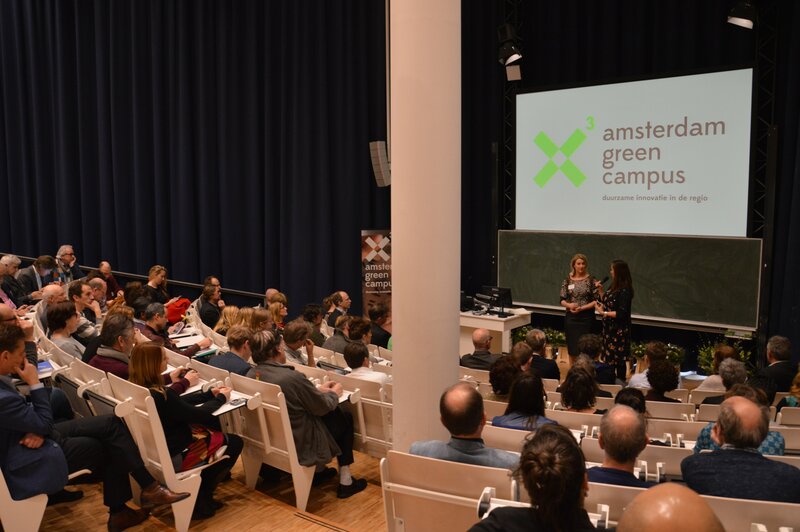 Getting involved with Amsterdam Green Campus via an internship or otherwise, the platform can offer endless networking opportunities and valuable work experience. Upon graduation, employers will likely value these skills. But moreover, it is imperative to the ambition of several students to contribute to real-world and innovative projects. That is, as Schoenmaker mentioned, working on projects like these often motivates students even further.